The high corrosion resistance and durability to withstand extreme temperatures without losing shape are two notable properties of this product. 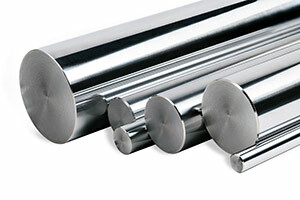 The stainless steel milled stud is an ideal choice in high vibration/high friction applications. Specifications – One end is Class 5 thread fit and the opposite end is 2A thread fit for self-locking, friction-fit. The double ended stud is inserted into a threaded hole on one end and threaded to a nut on the other. The threaded end that’s driven into the parent material for a mechanical lock has a self-locking friction fit, which facilitates excellent mechanical performance. Greater Clamping Loads – Studs, being stationary, don’t bottom out on the hole and so a greater clamping load is achieved by simply tightening the bolt. Component Installation Advantage – Studs act as guide pins during installation of various items and hold the parts firmly in place. After the parts are aligned in place, nuts can be installed easily. Available in various configurations and adaptable to all national and international standards, the stainless steel milled stud also provides superior resistance to pull-out torque. 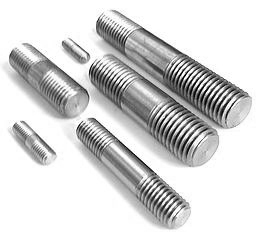 Double ended studs are used in turbine engines, transmission and gear box applications as well as materials in engines and vehicles. They’re also used in the part alignment of hydraulic control valves in the aerospace industry. Take a look at the Suburban Industries Catalog to see the available sizes and diameters of our stainless steel milled studs. If you need anything other than the models present, you can contact us and request a custom quote. Our team is more than happy to manufacture the particular custom milled studs you need, and we can get products to you quickly and efficiently.